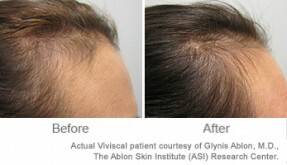 The root of hair loss is often treatable. 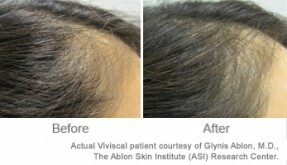 In some cases, by improving diet, hair care techniques, or reducing stress, thinning hair is reversible. 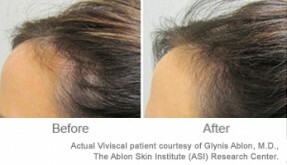 But did you know that dehydration also can cause hair loss? 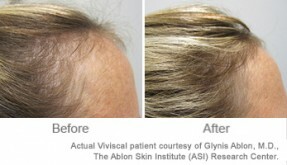 Hair loss from dehydration is one of the easiest hair loss causes to fix. Read on to find out how hair loss and dehydration are related, and tips for how to stay hydrated. Water is essential to cell health and growth, delivering nutrients and removing waste from the body. The average human loses two to three quarts of water every day. If we don’t drink enough water to replace what’s lost, we become dehydrated. Since water is required for so many bodily functions, a dehydrated body can no longer function at optimal levels. Dehydration has many negative effects. Signs of even mild dehydration can include dizziness, headaches, muscle weakness, and fatigue. Just as nutrition is vital to hair health, so too is drinking enough water. Your hair structure and water are interrelated. Water makes up one-fourth of the hair strand, and hair follicles require adequate amounts of water in order to grow new hair. So how does dehydration lead to bald spots? 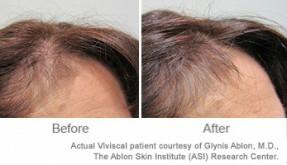 While short-term dehydration will not harm your hair, chronic dehydration can cause hair loss. Your body considers the integumentary system (i.e. your hair, skin, and nails) to be non-essential. When you don’t drink enough water, your body reroutes any much-needed water to your more vital organs. 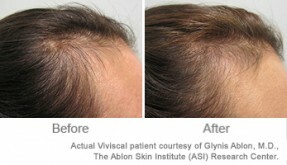 Since your hair follicles lack water, they will stop producing new hair. If you’re chronically dehydrated, your follicles won’t grow enough hair to replace the strands that are shed naturally, resulting in hair thinning. What’s the Best Water for Hair Health — Distilled, Mineral, Tap, or Carbon-Filtered Water? The best water for hair health is natural spring or mineral water. Natural spring water contains many vital minerals and is the best way to hydrate your hair and body. While distilled water still provides hydration, it does not contain as many vital minerals as mineral water. If you only have tap water on hand, tap water is perfectly fine to drink. Although a simple carbon filter will greatly improve the quality of your tap water. The most important thing is to make sure that you get enough water per day! According to the Institute of Medicine of the National Academies, women should consume 2.7 liters (91 oz.) of water per day, and men should could consume 3.7 liters (125 oz.). If that sounds like a lot to you, follow these simple tips to drink more water and stay hydrated. If drinking multiple liters of water sounds boring to you, try adding sliced fruit or veggies. Make your own hair-healthy infusions by combining mineral or tap water with lemon, strawberries or cucumbers in a pitcher and chilling. Having a difficult time keeping track of how much water you’ve had? Let your phone do the work for you! Apps like Daily Water Free and Carbodroid allow you to calculate your water intake easily. You’ll be more likely to drink water if you keep it close at hand. Keep a liter bottle on your desk at work or in your bag to make sure you always have water with you. Mark up a water bottle with ounces or hours to help you keep track of your progress. Alternatively, you can buy pre-marked bottles to help you reach your hydration goals. Some foods and drinks can lead to dehydration for the body and hair by causing the body to lose more fluids. These include alcohol, sodas, fruit juices, sugar, and coffee. If you do indulge in one of these dehydrating foods or drinks, make sure you drink extra water to replace the fluid lost. Do you have any tips for drinking more water? Let us know in the comments!